The resort, Kalami, was very clean, with several nearby supermarkets, three restaurants, car and boat hire facilities. The evening entertainment was at the hotel or one other bar, or one could get a water taxi to Corfu town. The beach was pebbly, and very clean and was easily accessible from our apartment. The sea is crystal clear and safe for all ages. Our five year old enjoyed himself. You can hire sun beds and umbrellas for the day. We will definitly go back to these apartments and Kalami again. !! As a resort Kalami is breathtaking with is stunning views and pebbly beach. generally my holidays are action packed but this time it was nice to go away and relax (with the option of doing things should you chose)and there isnt a better place than kalami for relaxing. As a relaxing resort there is not much more you can ask for - its clean, has friendly locals and bars, amazing views and good restaurants. Overall, i recommend Kalami and would definately return. The beach was very pebbly, and a fair bit of litter thrown around, not a great beach for kids as there was very little sand for them, having said that the water was great. Entertainment in the resort of Kalami was very low key but fun and good value. This is a very quiet and peaceful resort. Clean stoney beach and a short walk to sandy beaches. There are very friendly tavernas on the beach and good value for money. This resort is a perfect place to go if you want to chill out and unwind from all your stress in the UK. I spent 2 fantastic weeks here and I was horizontal at the end as it is the most tranquil place to visit. There is a huge lot to do. We chilled out on the beach during the day, sometimes hired a boat or did a bit of water skiing or ate which we did a lot of in the Kalami beach taverna which is the first taverna you come to as you enter the village. The food is fabulous and not over priced and the waiters and owner are exceptionally friendly they treat you like one of the family. During the evening we would have a meal and then take a walk through the village, the supermarkets never seem to shut and they sell everything you need. I went to make a phone call not realising I needed a card but the kind Greek lady popped out from the supermarket opposite Giorgos supermarket and told me I needed a card. We would then finish the evening with a few drinks at our pool bar Summer Dreams, it is such a nice chilled out atmosphere, great friendly service; you could chat to other people staying in the village or watch the big screen TV which my husband enjoyed. kalami is beautiful and we are thinking of going back next year in a villa.this is the only place i have been to where i didnt want to leave.the greek people in kalami are so freindly,we didnt find one that wasnt.not many bars in kalami but,if you want nightlife its not that far away.if you want to party all night then kalami isnt the place,with a daughter of 8 we couldnt do that anyway,please try kalami its a dream holiday you will never forget. Nice relaxing resort with only a few tavernas but they are nice. Ideal for a few days but would be hard to occupy a fortnight or a family. 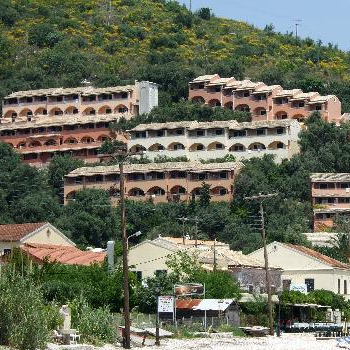 the resort is quite clean and tidy, there is practically no entertainment apart from karaoke an greek night once a week. kalami is definetly not for young people looking to party, its more for older people just wanting a relaxing peaceful holiday. i wouldnt go back to kalami in a hurry.